Jenner Vacation Rental home, cottage, Riverfront to Pacific ocean views. Erinleigh by the Sea offers a romantic couples dream at sea level. 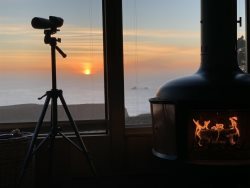 Instead of waking to the sound of traffic, this small jewel getaway shares its address with the Blue Heron, River Otters, Bald Eagles, Harbor Seals and is located in view of "Penny Island" an estuary/bird sanctuary on the Russian River in Jenner By the Sea on the California Coast. Relax and contemplate the beauty that surrounds you from this cottage hideaway. The Russian River is your front yard and Pacific Ocean is just around the bend. So bring your Kayak or rent one, pack a picnic and walk the oceans edge, hike a trail or two and view Life a little differently. Through a private gate entry from Hwy One in Jenner is a full flight of stairs going down to Erinleigh by the Sea Cottage entry. There is a wrap around deck from entry to riverfront views. Living Area: Erinleigh by the Sea Cottage offers an open concept one level living area. Living/Dining open to kitchen. Bedroom and bath are separated by hallway. Due to the septic system, parking and location this property can only accommodate the number of persons the house can sleep (2).